After a seven year absence, the Club brought its members back to Shanghai in June 2015. It was a raving success in every sense, except, perhaps, one — it was raining most of the day when members were on the Shanghai F1 Circuit. 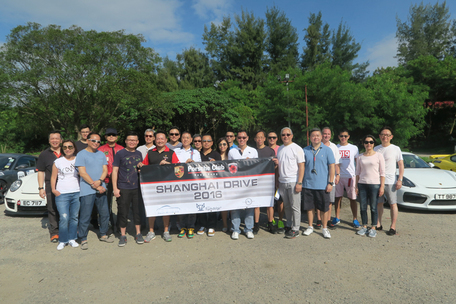 The Club noted the frustration, and in mid-October 2016, the Club repeated its efforts in organising yet another exciting Shanghai Drive. The Drive took place between 14th October (Friday) and 19th October (Wednesday). 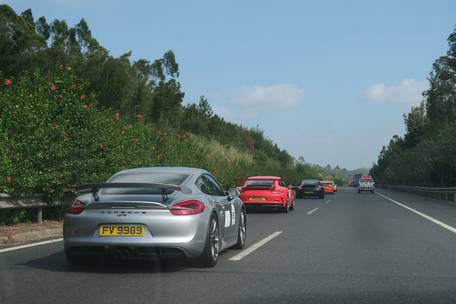 18 different models of Porsches, ranging from 993s to the latest 981 GT4, started off from Hong Kong. They headed first to Meizhou (梅州), followed by Yingtan (鷹潭), then Hangzhou (杭州市) and finally arrived in Shanghai. Driving distance was spread out pretty evenly among the three days. 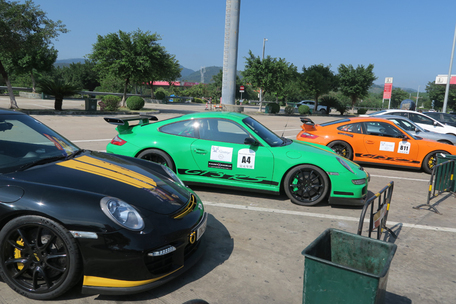 Road conditions were good and members were generally able to arrive at the hotels before 5 p.m. everyday with plenty of time to relax before a sumptuous dinner with fellow Porsche enthusiasts. 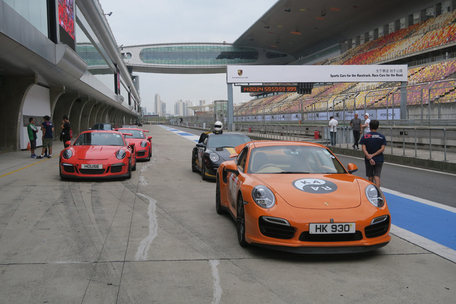 18th October—Track Day at the Shanghai F1 Circuit—members were all eagerly looking forward to this day. Several other members flew to Shanghai and rented track cars just to experience the Shanghai track. None of them was disappointed, and most important of all, there was no rain throughout the day. Talking about good fortune….. the GT Asia Series that was held in the immediate following two days were subject to completely rainy conditions!! The 5.451 km Shanghai Circuit was as challenging as members remembered; it took members some laps to re-familiarise themselves with it. Turns 1 and 2 are particularly tricky as the turn gets progressively tighter and tighter and the driver is expected to downshift smoothly in the middle of the turn. Then there is the ‘S bend’ combination of Turns 7, 8 and 9 where car balance and the overall speed are both critical as opposed to the maximum speed at any one particular corner. Finally, there are Turns 12 and 13 before the long straight run where the driver is expected to upshift in the middle of the turn which seems like never ending. The Club’s good friend, Darryl O’Young, was racing at the GT Asia Series the following day. Nevertheless, he showed up in the afternoon to give members some pointers and hot laps to wrap up a perfect track day, a perfect end to a fabulous road trip.